How long will Germany Nazi politicians last with their Censorship? Germany puts a Ukraine under false charges and possible assassinates him. His name was John Demjanjuk. John Demjanjuk was falsely charged under Stalin’s Four Million Martyrs Doctrine and found guilty in support of a Holy Shrine Stalin made to cover up his Katyn Massacres and other War Crimes he had done. John Demjanjuk dies under mysterious circumstances. He could have been poisoned or done away with by Germany’s corrupt politicians. A chief mobster has been pointed out as being the Neo-Nazi, Kurt Schrimm of the Zentrale Stelle der Landesjustizverwaltungen in Ludwigsburg, Germany. If for nothing else, he certainly carries one of the main guilt of condemning an old man under false charges. In another notorious German Witch Trial Show Trial, the corrupt judge, Ulrich Meinerzhagen, stated it was not relevant if a ‘smoking gun’ existed or not. The thing was, that the law prior said it does exist, and that is what matters. The cruel Nazi butcher then sent his victim to 5 years in jail just so that he could line his own pockets and feather his own nest. The Holocaust Extortion Cult, the HEC Cult, also called Exterminationism, started with Stefan Szende, who; claimed Hitler has killed 5 million people at Belzec in some type of a swimming pool water tank run by electricity. In order to hide his collaboration with the Nazis, Stefan Szende, claimed that Jews got their Penises put onto fresh new Foreskins in order to hide so that Hitler couldn’t find them. 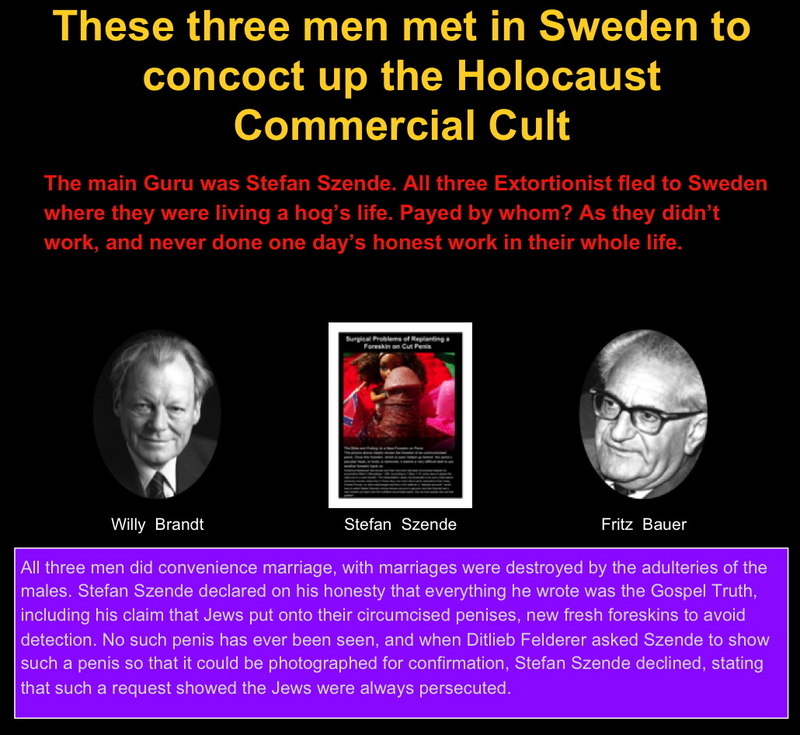 Stefan Szende was joined in with Willy Brandt and Fritz Bauer who met in a bar and begun to concoct up Exterminationism, the HEC Cult. All this then evolved into the Pension Fraud Crimes (PFC) whereby money came to be extorted from various countries on basis of Stalin and his Auchwitz Vomitorium fakes. Ukraines are now finding out about this swindle. All this make good sense that the War Criminal, Angela Merkel, has reason to fear that Germany’s involvement with the War Crimes wars against Iraq, Afghanistan, Libya, Syria, and now in Africa, will come to light, and who knows, those criminals behind may face same destiny as those in Nuremberg.